This is the time of year when you will see mushrooms popping up all over, and with all this rain we are having in the Bay Area, you’re likely to see even more until the weather starts warming up in March. It really pays off to learn about our local fungi – especially if you have children or pets. Mushrooms are actually the spore-bearing, fruiting bodies of fungus. They pop out of the ground in order to spread their spores for reproduction. They have an underground network of threadlike cells called mycelium that can live for many years, often growing in mulched areas, compost piles or on decaying tree bark and roots. Mushrooms are a highly sought-after delicacy around the world. But don’t start picking them and bringing them into your kitchen without knowing what you’re doing, In fact, never consume a mushroom you find unless you are 100 percent certain what it is or have had it properly identified by a qualified professional. I’ve listed some resources below. Mushrooms come in all shapes and sizes. Some mushrooms have caps (curved tops) with gills (feathery membranes) or pores (small holes) underneath. The caps are usually supported by stipes (stems/stalks). Others have rings and cups. Some varieties have stems that rise from a cup (also called the volva). In order to properly identify some mushrooms, a “spore print” and molecular identification is often required, said Hung Doan of the UC Davis Department Plant Pathology. 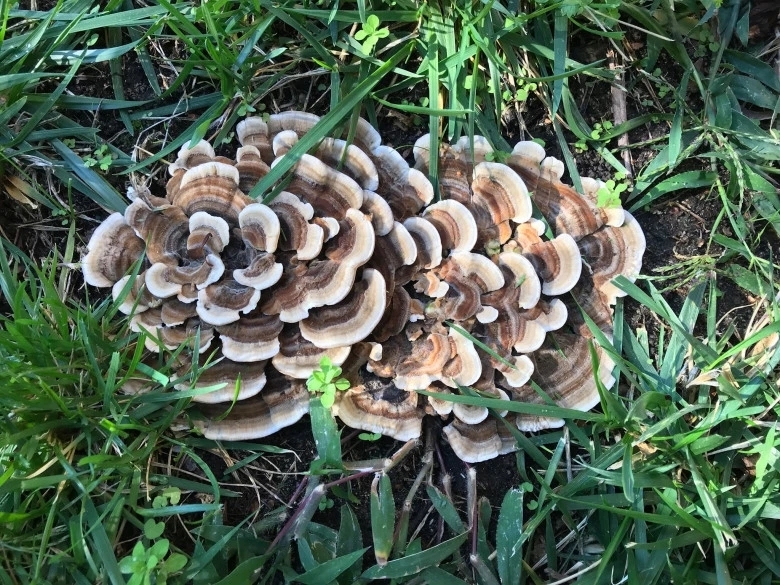 One of the most common mushrooms here is the turkey tail (Trametes versicolor), which can be found nearly anywhere you find decomposing stumps, logs or old wood. Their clustered, fan-shaped masses have contrasting shades of brown to reddish-brown, and their caps are velvety and slightly fuzzy. Another common species found in our area is the Armillaria (often called honey fungus), one of largest living organism in the world. It is a parasitic fungus that feeds on living and dead plant material. Their yellowish-brown caps can be convex or conical and are generally moist and sticky to the touch. One specimen of the species, Armillaria solidipes, found in Oregon, is said to be 2,400 years old, and covers more than 3.4 square miles! Although thought to be rare here in California. I found what appears to be Boletus erythropus (pictured above) in my own backyard. Since the mushroom is not fresh, proper identification can be difficult. Doan said it is likely one of two species — Suillellus amygdalinus (formerly Boletus amygdalinus) or Boletus erythropus. Its unusual and varied color really caught my eye. The large caps vary from dark to light brown or even coppery bronze. The pores start out orange and then become bright red to rusty brown. The spore tubes are lemon-yellow but turn blueish-green when cut or bruised. They can be found under spruce and beech trees, and occasionally under oaks, as this one was. Several varieties of mushrooms are toxic, but very few are actually deadly. One of the most deadly found here in the Bay Area is the Amanita phalloides, Death Cap, which has rings and cups as described above. It accounts for nearly 50 percent of all deaths caused by mushrooms. Symptoms of toxicity include severe cramping, vomiting, diarrhea and stomach pain. It can cause liver and kidney damage, and as the name implies, often death. Its large, spore-less cap can be 2-6 inches wide and can range in color from pale yellow to olive-green. The cap is covered by a thin white veil. Stems and gills are usually white, and have a ring and cup (you may have to dig into the soil to see them). It is often mistaken for the edible Paddy Straw mushroom (Volvariella volvacea), which has pinkish-brown gills. Death Caps are generally found when out hiking and or foraging in our coastal hills where coast live oak and cork trees are found, but can be found in urban areas as well. There are edible varieties of Amanita, but avoid them unless you are a skilled and experienced “shroomer”. Next "In December, there were too few mushrooms to satisfy demand"